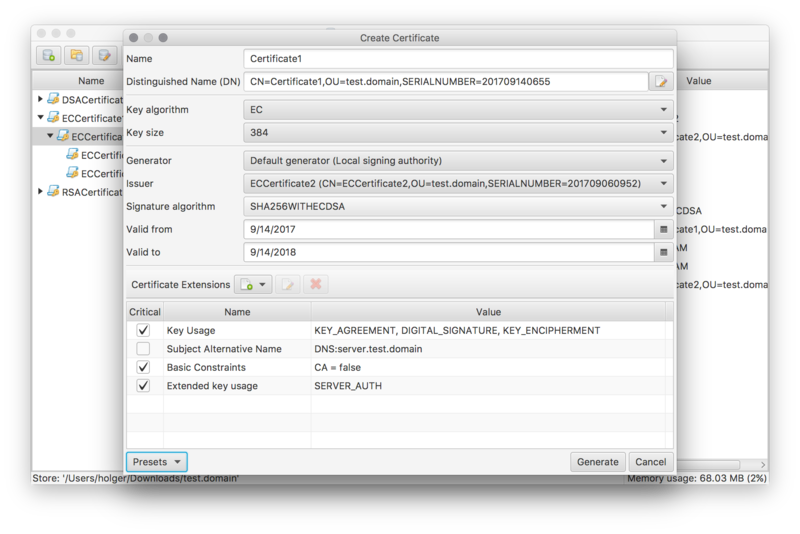 The Certificate Manager application (CertMgr) supports the creation and management of X.509 certificates and their corresponding objects. Certificates are organized in so called Certificate store. Such a store is actually a simple directory structure containing the individual certificate files. A Java SE 8 Runtime Environment (JRE 8u60 or higher) is required to run CertMgr. Download the latest version from the project’s releases page. The provided installer/launcher packages have been created using the multi-platform installer builder Install4J. Simply run the installer suitable for your platform to install the application and keep it up-to-date. The store home path to open.